Richard Balikoowa from Uganda was one of 16 teachers from seven different countries who studied on campus and taught in local schools from January through May. They are part of the International Leaders in Education Program, a professional exchange program funded by a subgrant from the International Research and Exchanges Board (IREX), which is funded by the U.S. Department of State Bureau of Educational and Cultural Affairs. The teachers completed an on-campus academic program with some of Clemson’s School of Education faculty, and then interned with a partner teacher at Riverside Middle, Liberty Middle and Seneca High. As part of this program, which is in its sixth year at Clemson, the teachers engage in formal and informal cultural activities in which they learn about American culture and share about their own. Teacher Fellows go through a yearlong selection process; they are nominated by their own country, approved through that country’s American embassy and local Fulbright commission, and screened through the U.S. State Department and IREX. Clemson is one of four universities selected to host the group. 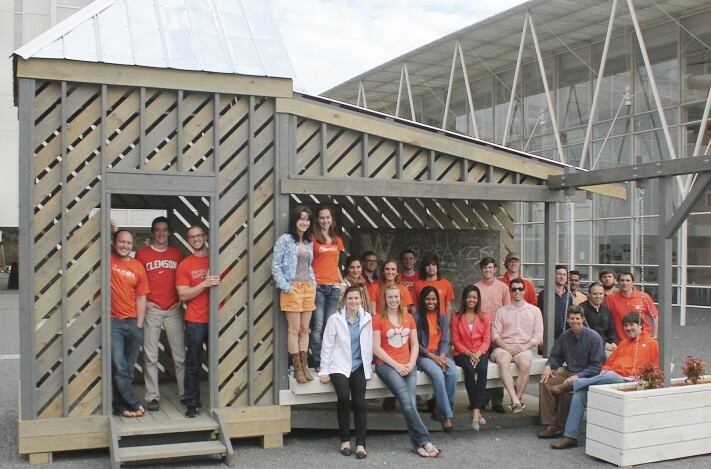 The U.S. Department of Energy selected a Clemson team to compete in the Solar Decathlon 2015. Clemson is one of 20 colleges and universities across the country and around the world that will now begin the nearly two-year process of building solar-powered houses that are affordable, innovative and highly energy efficient. Over the coming months, the Solar Decathlon teams will design, construct and test their houses before reassembling them at the Solar Decathlon 2015 competition site in Irvine, Calif. As part of the Solar Decathlon, teams compete in 10 different contests, ranging from architecture and engineering to home appliance performance, while gaining valuable hands-on experience. In fall 2015, the student teams will showcase their solar-powered houses at the competition site, providing free public tours of renewable energy systems and energy-efficient technologies, products and appliances that today are helping homeowners nationwide save money by saving energy. The solar-powered houses will represent a diverse range of design approaches; building technologies; target markets; and geographic locations, climates and regions, including urban, suburban and rural settings. The Solar Decathlon helps demonstrate how energy-efficient and renewable energy technologies and design save money and energy while protecting local communities and boosting economic growth. President Clements presents Self Regional’s Jim Pfeiffer with a bowl crafted from a cedar tree at Fort Hill, the historic home of John C. Calhoun and Thomas G. Clemson. In February, Clemson, the Greenwood Genetic Center and Self Regional Healthcare announced a new partnership that will establish formal collaboration among genetic researchers and Clemson faculty. Self Regional Healthcare will support Clemson’s Center for Human Genetics with a gift of $5.6 million over three years. The gift consists of an initial contribution of $2 million for the center’s facilities and a subsequent contribution of $3.6 million to support research in genetics and human diagnostics at the facility located on the Greenwood Genetic Center campus. Self Regional and the Genetic Center have had an affiliation agreement since 1975 with the Genetic Center’s clinical faculty serving as the Department of Medical Genetics for Self Regional. The center will address research and clinical opportunities in human diagnostics and epigenetic therapeutics advancing personalized medicine for intellectual and developmental disabilities, autism, cancer, diabetes, heart disease and disorders of the immune and nervous systems. Specific research will include molecular diagnostics and therapeutics, bioinformatics and computational/systems biology. Self Regional Healthcare, as a research and lead health care partner, will support hospital-based clinical trials and collaborate in designated research activities. 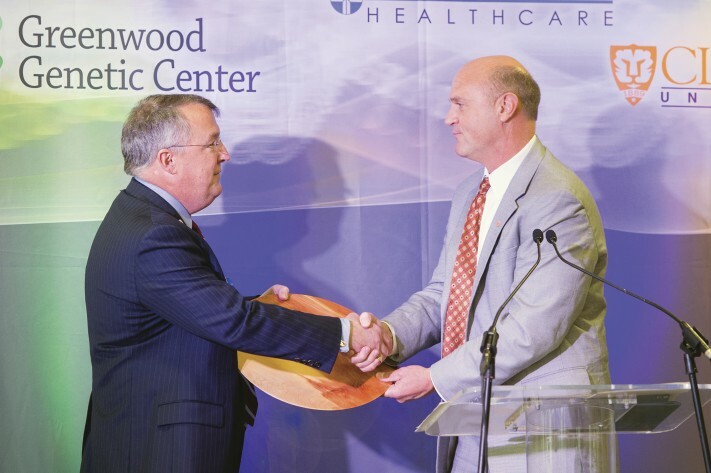 This marks Clemson’s third significant development at the Greenwood Genetic Center. In June 2013, Clemson announced it would expand its genetics programs, create an internationally competitive research and development team, and expand research capabilities at the Greenwood Genetic Center’s J.C. Self Institute through the Center for Human Genetics, a 17,000-square-foot research and education center in human genetics. And in November, Clemson established the Self Family Foundation Endowed Chair in Human Genetics, jointly funded by the Self Family Foundation and the state of South Carolina. John Ballato 2013 recipient of the Class of ’39 Award. With the increasing popularity of Sci-Fi movies, it’s no surprise that lasers conjure up images of futuristic adventures in outer space. But materials science and engineering professor John Ballato’s work in fiber optics isn’t happening in a galaxy far, far away — it’s all happening right here in Clemson. Although Ballato and his team don’t make the lasers that are sent to the battlefield, they do help develop the fiber optics that go inside them. The program’s success in the field of specialty fiber has enabled Ballato to work closely with the U.S. Department of Defense Joint Technology Office, which has invested more than $10 million in COMSET over the past eight years. Ballato served as the interim vice president for research and associate vice president for research and economic development, where he championed Clemson’s advanced materials related research and economic development. His achievements speak volumes, but this award may be the most meaningful. Ballato was chosen by his peers to represent the highest achievement of service to the University, the student body and the larger community. As the 2013 winner of the Class of ‘39 Award, Ballato’s name will be engraved in stone next to 24 past winners. The Class of 1939 established the Award for Excellence in 1989 to commemorate the 50th anniversary of the class and to recognize and inspire faculty service above and beyond expectations. In March, President Clements announced that Ballato would take on additional duties as the University’s vice president for economic development. Clemson’s Air Force ROTC detachment gathered in March to send Lieutenant Colonel Tom von Kaenel on a 120-day bicycle journey to Juneau, Alaska, to raise awareness of the sacrifices of service members, veterans and their families since 9-11. Kaenel is the founder of Sea2Sea, a military nonprofit that organizes bicycling events across the country, partnering with other nonprofits and local organizations. During the memorial service held that day, Clemson cadets read the names of South Carolinians who lost their lives in Iraq and Afghanistan. 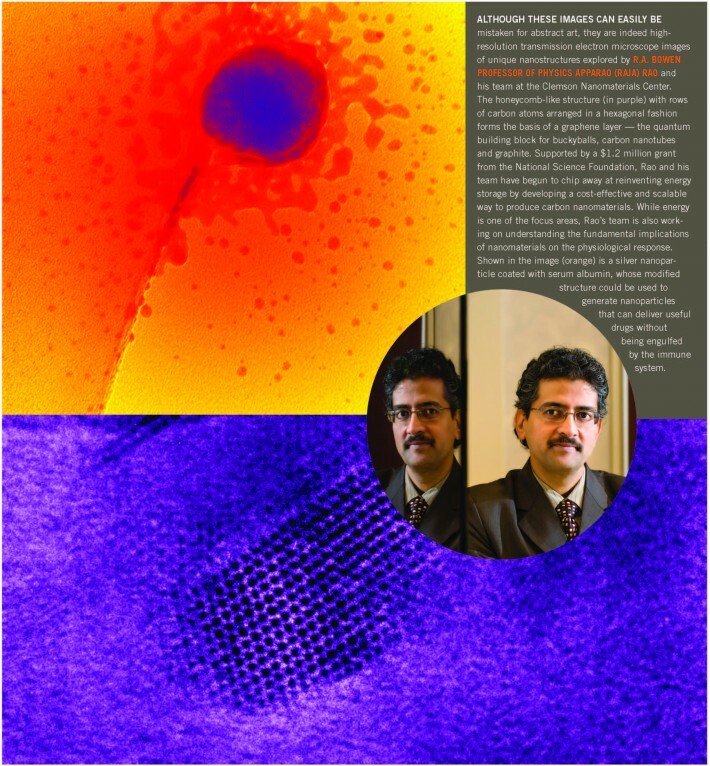 Although these images can easily be mistaken for abstract art, they are indeed high resolution transmission electron microscope images of unique nanostructures explored by R.A. Bowen Professor of Physics Apparao (RAJA) Rao and his team at the Clemson Nanomaterials Center. The honeycomb-like structure (in purple) with rows of carbon atoms arranged in a hexagonal fashion forms the basis of a graphene layer — the quantum building block for buckyballs, carbon nanotubes and graphite. Supported by a $1.2 million grant from the National Science Foundation, Rao and his team have begun to chip away at reinventing energy storage by developing a cost-effective and scalable way to produce carbon nanomaterials. While energy is one of the focus areas, Rao’s team is also working on understanding the fundamental implications of nanomaterials on the physiological response. Shown in the image (orange) is a silver nanoparticle coated with serum albumin, whose modified structure could be used to generate nanoparticles that can deliver useful drugs without being engulfed by the immune system.